i know i quit blogging about indiana politics years ago (and have no intention to resume), but how can i stay away when the whole country is talking about us? as everyone already knows, the state legislature passed SB 101, the so-called "religious freedom restoration act", in a brazen attempt to protect our state's homophobic businesses from having to serve gay couples. many states are or were trying to do the same this year, but we were the first and for that we have earned the nation's scorn. as far as anyone is concerned, indiana is officially bigot central. It's no wonder we now live in a country where an element of the government can assassinate a president, civil rights leaders and other world leaders with impunity and carry out false flag events and propaganda campaigns against its own people and have the media castigate the discerning citizens among us as crackpot conspiracy theorists. Creating false realities is now the modus operandi. 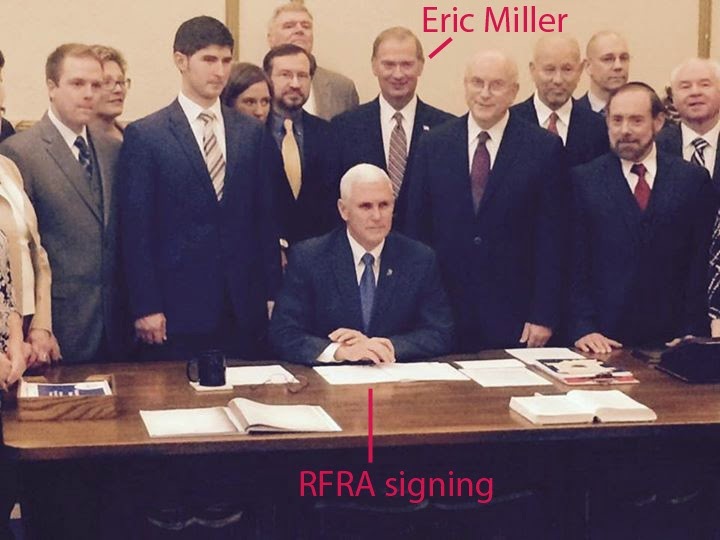 "RFRA legalizes discrimination" is a false narrative gone viral. The seriousness of the charge matters more than the nature of the evidence. so where did all we evil, duplicitous liberals get the idea that this bill was intended to legalize discrimination against gays? maybe we got the idea from scott schneider! On the other side, conservative groups with deep ties to many Indiana churches are lobbying hard. One such group, Advance America, is making a fact sheet available to churches. "SB 568 will help protect individuals, Christian businesses and churches from those supporting homosexual marriages," it says. "Christian bakers, florists and photographers should not be punished for refusing to participate in a homosexual marriage!" When asked if the pending legislation would afford such protections, Schneider said it would. Senate Bill 568 is the Religious Freedom Restoration Act. Senator Scott Schneider is the author of SB 568. Co-authors include the following Senators: Dennis Kruse, Brent Steele, Carlin Yoder, Jim Buck, Amanda Banks, Liz Brown, Jim Smith, Jim Tomes and Greg Walker. SB 568 will help protect religious freedom in Indiana by providing protection for individuals with sincerely held religious beliefs, along with Christian businesses and churches. SB 568 will help protect individuals, Christian businesses and churches from those supporting homosexual marriages and those supporting government recognition and approval of gender identity (male cross-dressers). This is the first time I have ever read one of your blogs. I whole heartedly agree with you. Great blog, thanks for posting it. Having said that, I nearly got a migraine from the background. Please, man, that is torture on the eyes.